90% of our customers (and others, I think) call in for balloon arches and balloon centerpieces. Nobody would argue that balloon arch is nice thing to have at a party. And good chunk of our budget comes from creating arches. But there is a BIG mismatch! This is not the only God had in mind when he gave us the balloons! Dear everyone! Please see how much fun and excitement you can create with all these practically unknown decoration! First of all, it is the best way to display name of the person to be celebrated, name or logo of a company on their party or trade show. Or it can just say "welcome" or any other message. And not nesseserely in English. There is a variety of ways to write a name. 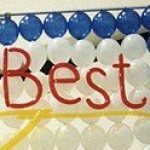 It can be letters made out of long thin balloons (usually used by twisters to make animals). 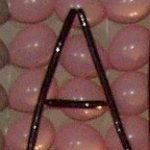 It is not very easy, but they can be almost any color (long thin balloons are available almost in any color) and can be done relatively small. If there is a need to make the writing very small or a lot of it ( I would not recommend it, but there are all kind of special cases), cut out paper letters can be used as well. 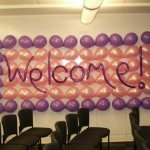 If the wall is large enough, mylar balloons in the shape of letters can be used. Looks very good. Limitations are: letters like "W" can take up to 3' (so, say for my name "Mikhail" the wall has to be at least 17' long!) and only silver and gold colors are available. 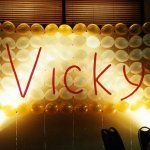 However, if the name or slogan is not too long, the fact that letters are mylar (another words, they reflect light very well), can be used with great benefit: once we install balloon blinking lights around every letter of the name which made the whole name shine. What a seen! It was the name of a one year old gentleman and his parents were VERY happy! He did not mind it either... (sorry, the wall was created in a Christmas rush, we had ten thousand jobs to run to, so picture is not available. May be the customer will share with us some day...). Needles to say (really? ), but balloons and lighting works together perfectly! Balloons reflect light, balloons work as color filter, coloring everything in the theme colors. A lot of times the lights can be obtained from facility as a favor or for a very modest price, or from DJ, also very inexpensive. 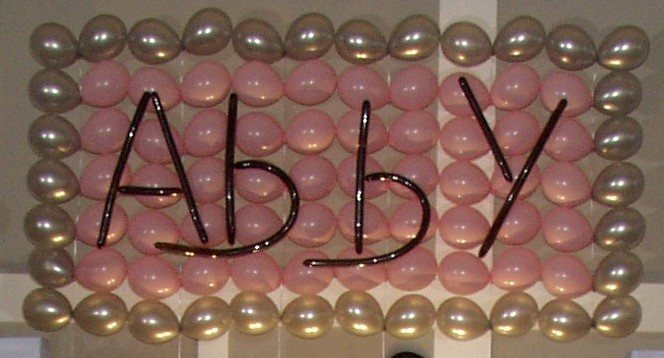 Balloon walls are no exception: here is an example of a regular balloon wall with name, lit with two stage lights. Logo or a picture or a word in some language we do not know - all the same. Can be done. The logo of the SYSCO company on a trade show in Virginia Beach is a good example. The wall was approximately 20' by 20', it was air filled and on a frame and it was there for the whole trade show - 3 days. 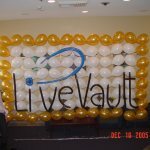 But this is one of the most often requests from the corporate customers - balloon wall with logo (no, they do not ask for the wall, they had never heard of it, just like you, they need to put the logo on display! ), so here is another example: Christmas season, balloon sculpture on one side of the foyer at the front door, the balloon wall with logo - on the other. If the wall is stationary, it can be air filled on a frame, which is, considering rising helium prices, so good today. But, if it need to move, it must be helium filled. When would one need the movable wall? "Maple Leaves" festival in Montreal. The organizers rented a great auditorium with a huge space for performers, but no 'stage curtain'. We have made it: two balloon walls were moved in to hide the stage for changes and out when it was ready. Third - back drop and wall decoration. Works wonders! When you substitute a plain wall for balloon wall in the colors of the party - it makes a big difference. Here are the two good examples. The blue and silver wall was made for a graduation party, just as backdrop behind the DJ station (very good choice, most of the time guests of the party look where something happens - dance floor, DJ station). In that particular case we used balloon blinking lights in the balloons of the wall. Looked amazing when the ceiling light was dimmed. The second example is an American Flag, to be placed on the wall behind the orchestra on a corporate party with patriotic theme. We have committed only one mistake: it should have been bigger! That is the beauty of the walls - very easy to make much larger! And, which is not always true in our industry, the larger is almost always better when it comes to balloon walls.